In recent times, the demand for stainless components has increased considerably. New types of automatic machinery and new hygienic specifications, especially in food processing, have made the application cases more and more frequent. In addition to the need of the food, packaging and pharmaceutical industries, corrosion resistance requirements also are found in ship-building, off-shore oil equipments, for textile and fabric finishing machinery as well as chemical industry. 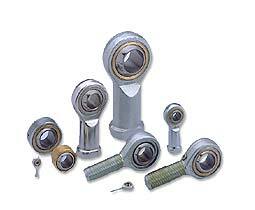 Rod ends belonging to the three sub-series have all the HEAVY DUTY - MAINTENANCE FREE construction features. The rod end body (marked as no. 1 in the sketch below) contains a spherical bearing made of a unfractured, solid bushing (no. 2, called “race”) and a spherical inner ring (no. 3) The inner concave surface of the race is lined with an anti-friction insert (no. 4) composed by a metallic fabric of bronze (or stainless steel) wire, coated with PTFE (Teflon). The rod end body is made out of forged, heat treated Aisi 431 stainless steel; the race is out of special bronze CuSn8 or stainless Aisi 316Ti steel. this "E" is the RODOBAL suffix unit for MAINTENANCE FREE units. Three degress of corrosion resistance are possible, depending on the kind of steel used for the spherical inner ring (no. 3): carbon steel 100Cr6, hardened, ground and hard -chrome plated, for the STAINPROOF units stainless steel AISI 420 hardened and ground, for STAINLESS units stainless steel AISI 316, ground, for EXTRA STAINLESS units Corrosion resistance degree is medium for the first type (suitable for 75% of the application cases), high for the second type (20%) and maximum for the the third type with AISI 316 inner ring. Units of this third type, female rod ends RF..SEJR.316 and male RM..SEJR.316, are used in most demanding conditions (i.e. fertilizer sacking. The AISI 316 stainless steel inner ring cannot be heat treated, so the load bearing capacity of this rod end type is only about 20% of the load capacity of similar units with hardened steel inner ring.